Ragnarok Online is one of the best MMORPG in the gaming industry. Ragnarok was created in 2002 by Gravity, a South Korean video game corporation and it was based on the manhwa Ragnarok by Lee Myung-jin. Ragnarok took Philippines by storm in the year 2003. Many players was saddened when Philippine Ragnarok Online by Level Up! Games officially shuts down on March 2015 due to its declining sales but players with active accounts were merged into International Ragnarok Online by WarpPortal on March 23, 2015. But one thing is for sure that Ragnarok players, fans and addicts will missed, and it is the 'Prontera tune or Prontera theme' because after you login and enter the game, you will definitely hear first the Prontera theme, the sound played by the main town in Ragnarok, the town of Prontera. 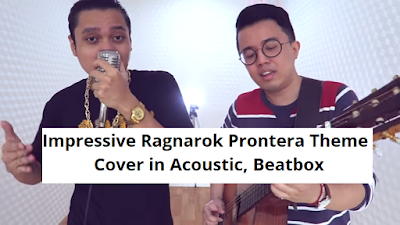 Enough for the brief introduction about Ragnarok, let's go watch this video of impressive Ragnarok Prontera Theme Cover in Acoustic and Beatbox by two Indonesian Youtube artists. The acoustic or guitar was played by Laurentius Rando and beatbox was performed by Christian Bong, member of Jakarta Beatbox. The combination of guitar and beatbox perfectly suits the calm and playful tune of Prontera. This will definitely give a throwback chills to the Ragnarok players and fans. Good news! Official Ragnarok Online will be published by a new publisher. Many Ragnarok players and fans are excited for this comeback of Ragnarok. This New Ragnarok Online server is free-to-play, so don't worry for top-ups for access just like Level Up! Games (Now Level Up! Play by Playpark) implemented pay to play in Ragnarok in its early years. Now, let's hear about your comments regarding this video and the comeback of Ragnarok online.